Comments: This wonderful Red Cross poster shows a snow bound house with a red cross in the window, looking like a wilderness cabin that is a refuge for cross country skiers. 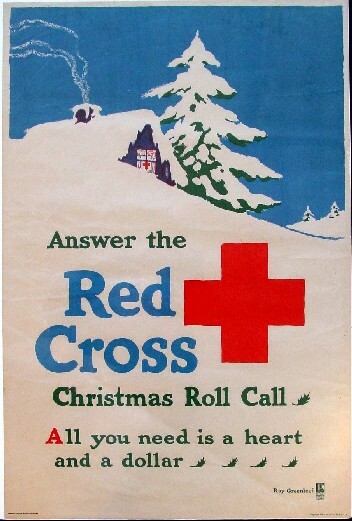 It gets you in the Christmas spirit receptive to the "All you need is a heart and a dollar" message of the poster which produced many contributions for the Red Cross.. Condition: Excellent, unbacked (the background color is uniform, the lighting for photography makes the right hand corner look lighter in the picture to the left).